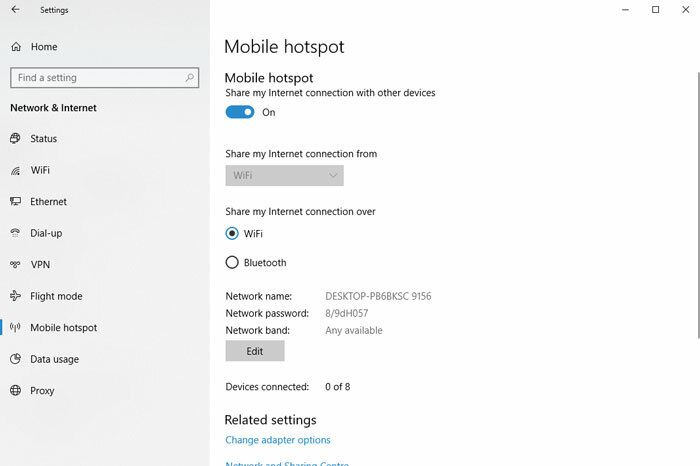 The mobile hotspot feature in Windows 10 has been kicking around for a few good years now, but it’s one of those things that’s worth being reminded about. If, for example, your PC is connected to a network that you’ve forgotten the password for, or your PC is connected via ethernet to a network that’s delivering little or no Wi-Fi signal to the room, that’s when the mobile hotspot can kick in, delivering your PC’s connection signal onto other devices. We’ll show you in his article how to turn your Windows 10 PC into an unadulterated Wi-Fi hotspot. Look for an adapter with the words “Wireless” or “Wi-Fi” on it. 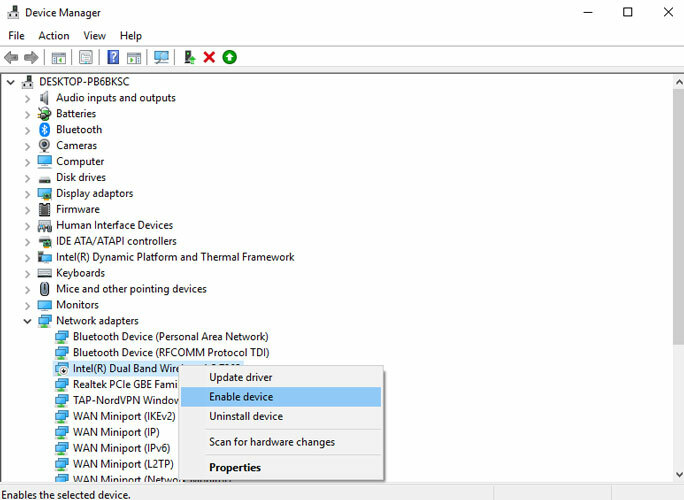 (For us it’s “Intel(R) Dual Band Wireless-AC 7265.”) If it has a downward arrow next to it, right-click it and click “Enable.” If it has an exclamation mark next to it, right-click it, click “Properties -> Driver” tab, then “Update Driver” (or “Roll Back Driver” if that fails). Once your Wi-Fi adapter is definitely working and enabled, right-click the Start button, then click “Mobile hotspot” in the pane on the left. Once you connect a device to the hotspot, that device’s name, IP and MAC address will show up in the Mobile hotspot settings. Annoyingly, there’s no direct way to kick specific devices off your hotspot, and to do this you’ll need to change the hotspot password. 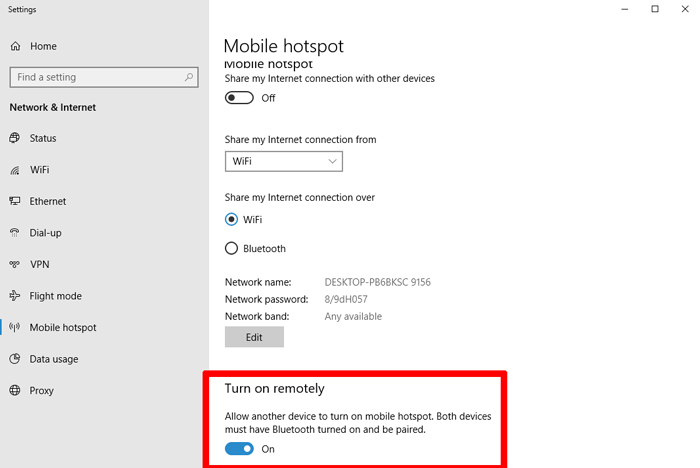 Another handy hotspot feature is the option to allow other Windows 10 devices to remotely turn on the mobile hotspot. To do this, your hotspot needs to be switched off in Windows 10 first. When it’s off, scroll down in the “Mobile hotspot” settings to the “Turn on remotely” option, and turn it on. Next, you’ll need to pair the devices you want the hotspot to have remote control of to your Windows 10 PC via Bluetooth. Once you’ve done this, the Mobile hotspot should continue to appear as an available Wi-Fi network on your device even when the hotspot is switched off. 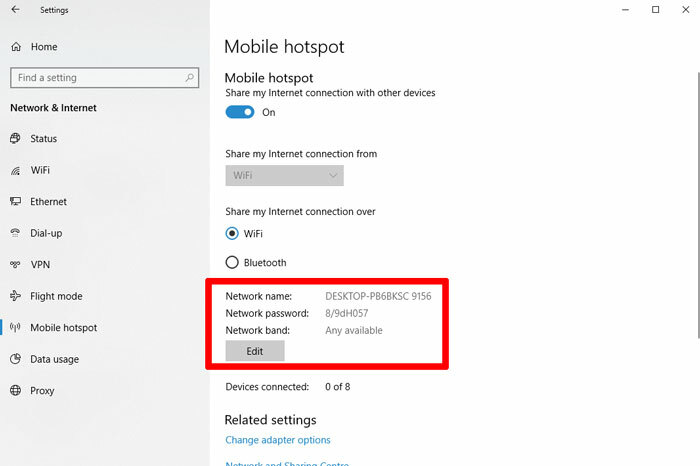 Selecting this network on the device you’re using will automatically turn on the hotspot on the main PC. Sadly, based on our testing this option doesn’t work with Android devices. And that’s how to turn your Windows 10 PC into a mobile Wi-Fi hotspot. You may have also noticed the option in the settings to share an Internet connection via Bluetooth, but this didn’t work for us at all, and our expectations weren’t too high for the kind of connection speeds that would have given us anyway. It’s best to stick with the Wi-Fi!